It’s a scene Terry Adelwerth has witnessed multiple times: A car pulls into a radio swap meet in upstate Rochester, and before the driver has a chance to shift into park, people surround the vehicle and are pulling on the door handles. “He’s rolling to a stop and they’re opening his doors and grabbing stuff,” Adelwerth said. Adelwerth’s wife, Deborah, jokingly called those eager people “vultures,” but they’re radio enthusiasts, anxious to be the first to lay claim to a needed part or an old-fashioned gem. Adelwerth, 59, of Center Moriches, isn’t quite that aggressive when it comes to antique radios. But he said he understands the impulse. 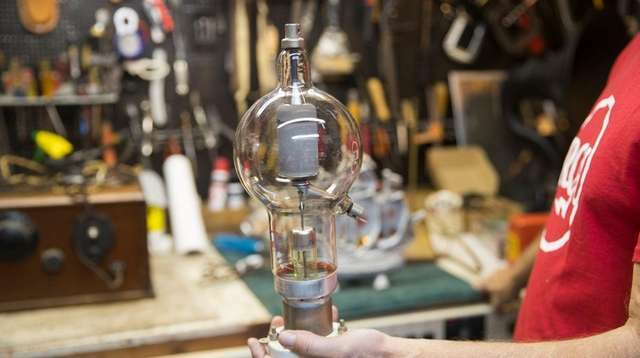 It’s not easy to find replacement radio tubes from the 1920s, or a General Electric tombstone-style or RCA cathedral-style radio from the 1930s that is still in working condition. 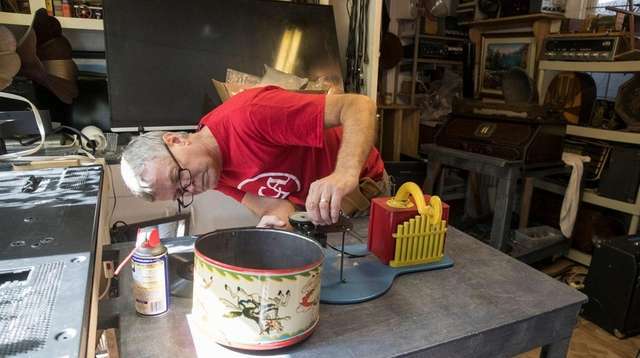 When he joins collectors at Long Island’s monthly radio swap meets in Seaford, or at the bigger regional ones he attends each spring and fall in Kutztown, Pennsylvania, Adelwerth is also hoping to score. 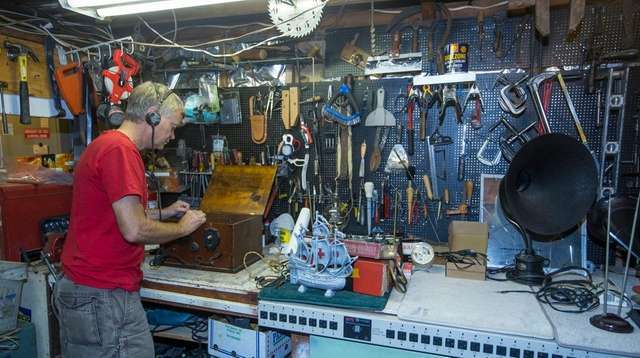 Radios aren’t just Adelwerth’s hobby — repairing them has also been his living for decades. He has been fixing televisions, radios, microwaves, vacuum cleaners, lamps, fans — anything electronic, really — for more than 30 years as owner of Johnny’s TV, initially based in Riverhead. He used to work full time out of an office there, earning enough money to buy a home and put his three children through school. But as TVs became more disposable — it’s now often not worth the cost of repair, so people buy a new one instead — Adelwerth has had to move the operation to the detached garage and basement of his house and find an additional part-time job to supplement his income. A small red-and-white sign outside Adelwerth’s house advertises “TV repairs.” But he said at least half of his current repair business caters to collectors who treasure the radios of days gone by. 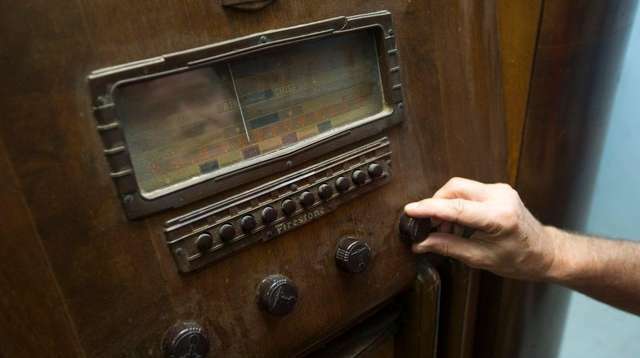 Adelwerth estimates he has 50 to 60 radios of his own — including his great-grandmother’s console-style radio that launched him on his lifelong passion when he was just a teenager. When Adelwerth was growing up in Eastport, he used to accompany his dad to the local dump once a week to drop off their garbage. He said he saw it as an opportunity to find broken objects to bring home, take apart and examine. Adelwerth was about 14 when his great-grandmother, Matilda, died. When relatives were cleaning out her house in Speonk, they weren’t sure what to do with her console radio, which was as big as a bedroom dresser and hadn’t worked in years. The family willed it to Adelwerth, who scavenged for old radio tubes and made it work again. Adelwerth studied in the BOCES TV repair program in 11th and 12th grades, and graduated from Eastport High School in 1975. “That really cemented what I wanted to do,” Adelwerth said of the BOCES program. In radio production’s infancy in the early 1900s, scientists bought their own parts and made their radios themselves, Adelwerth said. The first commercial radios were sold in the early 1920s, Adelwerth said, produced by companies such as Zenith, RCA and Grebe. They ran on batteries and came with huge antennas. In the late 1920s, RCA made the first set that could be plugged in. Adelwerth has a Grebe “coffin radio” from that era, so-called because that’s what it resembles. In the 1930s, cabinets were built around radios “because people wanted them to look nice in the house,” Adelwerth said. In the ’50s, radio cabinets started to be made out of plastic instead of wood, and speakers were built in. Adelwerth later worked at Johnny’s TV in Riverhead, and when the owner retired, Adelwerth bought the business, retaining the name and paying off his debt weekly over two years. He got married and had three children, the first when he was only 20 years old. He worked six days a week, and most of the time it was just him. “I had a few part-time employees here and there,” he recalled. About eight years ago, he transferred the business to his home. “This doubles as a museum and a workshop at the same time,” Adelwerth said of his detached garage. He’ll occasionally invite other radio enthusiasts over to see his collection. He’s also got radio paraphernalia such as an old RCA Factory service sign, which he found at a Kutztown radio meet. “I saw that and I had to have it,” he said. 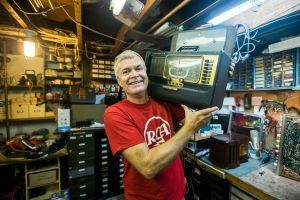 In his garage and basement, Adelwerth repairs guitar amplifiers and some flat-screen TVs, the latter of which he said belong mostly to older customers who have mastered their set’s remote and don’t want to figure out a new system. His average radio repair fee is $80, and TV repairs usually cost between $50 and $200. When the Adelwerths are listening to the radio, it’s likely to be Christian broadcasting, he said. Adelwerth also likes to talk to other ham radio operators as far away as South Africa or Hawaii. He’s got a 22-foot-tall antenna that sticks 10 feet off his roof. “It’s a monster,” Adelwerth said. His wife finds it amusing that even with his penchant for electronics, her husband still uses an analog flip cellphone. “I just don’t see the need for a smartphone,” he said. Adelwerth does embrace the internet because of its resources, he said. If he needs a schematic of a certain old radio, “chances are I’ll find it on the internet,” he said. Adelwerth uses Craigslist and eBay to find old radio parts, but he draws the line at modern podcasts, even though they are similar to radio broadcasts.